WASHINGTON -- The massive fines paid by Volkswagen Group and criminal indictment of seven of the company's executives are a "very strong deterrent" to cheating by other automakers, a senior official from the U.S. Environmental Protection Agency (EPA) official said. Christopher Grundler, director of the EPA's Office of Transportation and Air Quality, told reporters after remarks at a meeting of automotive engineers in Washington that the penalties have had a big impact. "It gets everybody's attention," he said on Wednesday. Asked if the EPA under President Donald Trump could reverse the Obama administration's decision to finalize the 2022-25 vehicle greenhouse gas emissions limits in its final days, Grundler noted that EPA nominee Scott Pruitt told a Senate panel earlier this month he would review the decision. "We will be prepared to brief him and his team on the work we did," Grundler said, noting that a new EPA administrator can revisit a regulation but must follow the same process. VW earlier this month agreed to plead guilty and pay $4.3 billion in U.S. civil and criminal fines to resolve its diesel emissions scandal. 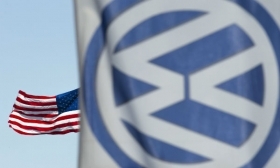 In total, VW has now agreed to spend up to $22 billion in the United States to address claims from owners, environmental regulators, states and dealers. Grundler said aggressive enforcement is key to automakers complying with emissions rules. One lesson the EPA learned from Volkswagen is "we need to avoid being too predictable in our compliance oversight," he said. The EPA launched a new round of real-world compliance testing in September 2015 after VW, which prompted its findings that Fiat Chrysler Automobiles NV were illegally using hidden software to allow excess diesel emissions to go undetected. Grundler said the EPA plans to post publicly more non-business confidential information on vehicle testing, including emissions recalls and defect reports to boost transparency. He added that the EPA wants vehicles to perform the same in the laboratory as on the road. "We want to discourage manufacturers from simply designing to the tests," Grundler said.